Zimbabwe is best known in recent times for its political and economic upheavals which have reduced the living standards of its people. Despite its poor economic state the people are very friendly and the country offers many attractions for visitors. 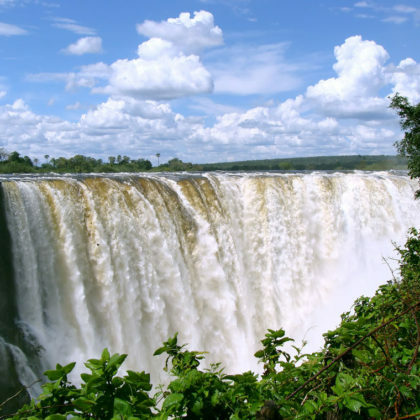 One of Africa’s greatest natural wonders is the Victoria Falls and in recent years many tourists have only just touched on its wonders by flying in to see the Victoria Falls but ignoring the rest of the country. Zambians don’t like to admit it but the best view of the majestic Victoria Falls is from the Zimbabwean side. You can also bungee jump off the iconic bridge over the gorge, go white water rafting or on a sunset cruise. This region has so much to offer. 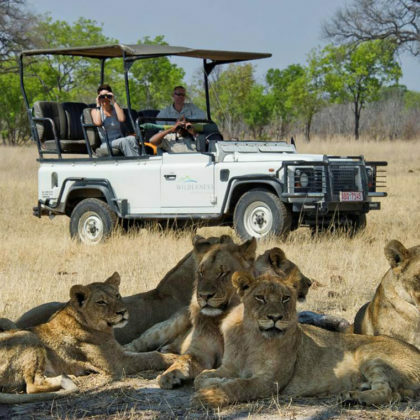 Zimbabwe’s largest game reserve is the Hwange National Park lying about one hour from Victoria Falls. Hwange is renowned as the home of one of the largest elephant populations in Africa. The Park is also home to over 100 species of mammals. It is one of the few places in Africa where Gemsbok and Brown Hyena occur in large numbers together. The Mana Pools National Park is one of Zimbabwe’s most scenically beautiful parks. It was declared a UNESCO World Heritage Site for its natural beauty. 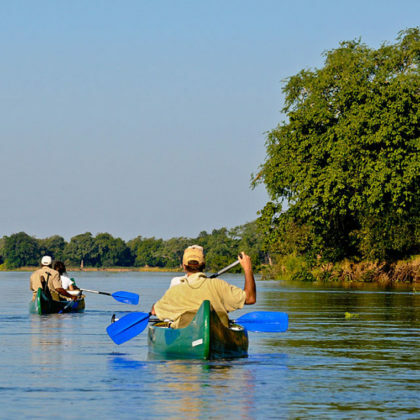 It is situated along the Zambezi River in the north west of the country sharing a border with Zambia. The floodplain woodlands create a cathedral like atmosphere giving the area a beautiful light much prized by wildlife photographers. 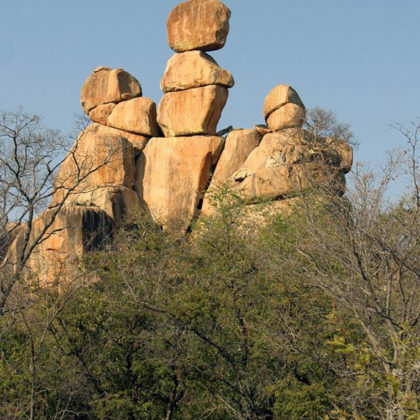 The Matobo National Park is characterised by distinctive granite hills whose rocks have been carved by erosion over the millennia into smooth dwalas scattered with balancing boulders. King Mzililkazi of the Ndebele nation to gave the area its name, which means ‘bald heads’. There are many sacred sites within the park and beautiful San rock painting sites. The country of Zimbabwe takes its name from the impressive ruins of Great Zimbabwe. 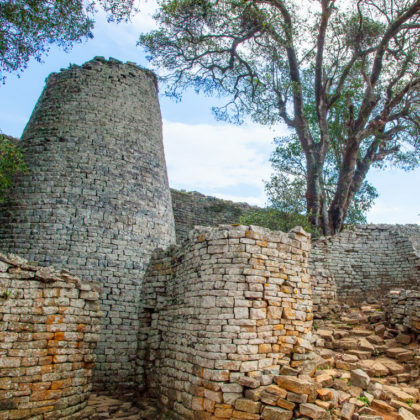 The remains of this city lie in the south east of the country near Lake Mutirikwe and the town of Masvingo. The city was the capital of the Kingdom of Zimbabwe in the late Iron Age between the 11th and 14th centuries. The city was built without mortar and some of the walls are over 5 meters high. The Gonarezhou National Park name means “place of many elephants” and the park lives up this and is famous for its elephants with large tusks. Highlights have to be the rare nyala and suni antelope and very rare king cheetah. 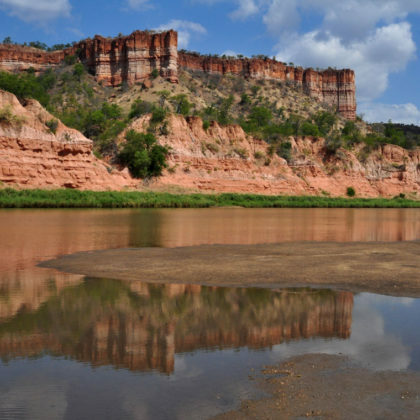 One of the landmarks of the Gonarezhou is the Chilojo Cliffs, a beautiful red sandstone escarpment which has been carved by erosion over many centuries.